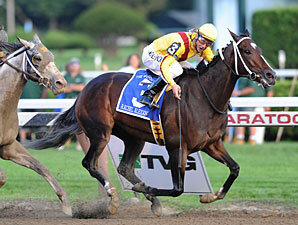 Opportunities to bask in the glow of historical perspective abound in Rachel Alexandra’s win in the Woodward – it’s difficult to imagine anyone else even close to Horse of the Year after such a performance – but the chance to see her become the first 3-year-old filly to hold that position since 1945 has been worth the wait. The full magnitude of what she accomplished today may take some time to set in; beyond the very few historical comparisons (most notably Twilight Tear and Busher in 1944 and 1945 – or going all the way back to Lady Primrose winning the Manhattan in 1887 – when she only carried 104 pounds), the sheer speed of the opening quarters was enough to torpedo most great horse’s chances. Indeed, it took a toll on the merely good – Past the Point and Cool Coal Man were the final two official finishers after pressing the pace, and Da’ Tara was eased in the stretch – he did not even officially finish. The early speed was such that Rachel Alexandra’s winning time was a full second faster than Curlin’s in the same race, and just a shade off Ghostzapper’s result (both of whom won at age 4). Between Sea The Stars commanding performance in the Irish Champion Stakes, which I watched this morning, and Rachel's gutsy victory this afternoon, I daresay it will be a long while before we see a day like this again.